Being on the heavier size might at times deprive you to wear cool and fashionable attires. 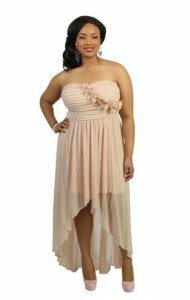 Well, you need not worry much as this gorgeous high and low dress is available in plus sizes too. If you have a prom night to attend then a long black, blue red or any vibrant colored high and low plus-size gown would look magnificent on you. A white lace high and low dress is a perfect pick for a summer wedding party. You can even buy a sleeved top and pair it with a high and low skirt to use it for casual wear. Moreover, if you want to bid goodbye to the long flowing wedding gowns and go for an outfit that would look stylish on you then a high and low wedding gown is what you need. Try arranging your tresses casually rather than tying it up tightly as it makes your face look smaller. Wearing a light chain and danglers will help you to look slimmer. © 2019 (Dressed-Up Girl). All rights reserved. Reproduction in whole or in part without permission is prohibited.